The legendary lost City of Atlantis is a mythical story that’s been told for many centuries, and while some evidence points to the ancient civilization once existing, scientists and historians are yet to find concrete evidence that it ever existed – at least on the scale that many believe. Thankfully, the guessing game’s over, as Net Entertainment have released their mythical City, and fittingly, it’s called – Secrets of Atlantis. This 5-reel slot uses 4 rows, and 40 fixed-pay lines to deliver an underwater, mythical experience, with a gorgeous backdrop featuring what appear to be long-lost buildings, lying forgotten at the bottom of the ocean’s bed. 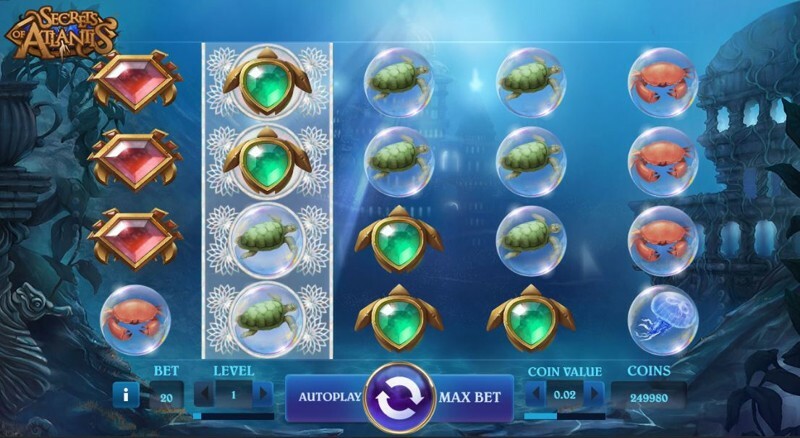 The reels are completely transparent, ensuring all players can enjoy the aesthetics of the game, and it’s clear Net Entertainment have put a lot of time, effort, and dedication into building Secrets of Atlantis. There’s not even any low-paying playing-card symbols on the reels – and that should tell you a LOT, coming from Net Entertainment! Instead, you’ll see a variety of gems, and animals, including Red, green, and Blue Gemstones, as well as Pearls within an Oyster Shell, Crabs, Turtles, and Jellyfish. The wild symbol appears as a stacked-mermaid, which – regardless of how much lands on the reel – will fill, and expand the entire reel she lands on, for the current spin. Secrets of Atlantis is also available to mobile players, thanks to Net Entertainment’s state-of-the-art, mobile-optimized technology, and phone and tablet users will be able to play this exciting, historic game. You don’t need to download any special software in order to begin playing Secrets of Atlantis, and a working Internet connection (preferably a 4G or WIFI connection) is all you need to begin. The Mermaid wild symbol is one of the most useful base-game inclusions we’ve seen of any Net Entertainment slot, and that’s because even a small part of her is enough to turn the entire reel wild. Secrets of Atlantis uses a unique both-ways-pay structure, which means not only do you get paid on wins from left-to-right, but also from right-to-left. This ensures you have double the chance of making a win, although it does of course double the cost of each spin; but it’s all relative, so don’t think too much into it. Behind some of the middle three reels (2, 3, and 4), you’ll notice that instead of a transparent background, there’s, instead, a light, white pattern, which spreads across 20 symbols. If you manage to land the three middle reels all with this white background, you’ll be awarded a Colossal Symbol Re-spin, and the entire middle block of symbols will then transform into one giant random symbol. You’re awarded one free-spin, and if you manage to match a winning combo either side of the Colossal symbols, you’re due a big payout. You can also re-trigger the bonus by landing the white background again, during the Colossal Symbol Re-Spin, and while this is uncommon, it’s generally pretty high-paying when it does make itself known.